Compare prices on car hire in Colmar from all the major brands and find the best deals. When you book through us, unlimited mileage and insurance are always included in the price given. Colmar is a city in eastern France , Alsace.Colmar is the capital of the Ministry of Haut-Rhin, and is located 15 kilometers west of the Rhine. Approx. 67,000 inhabitants live in Colmar. Colmar was founded in 800’s. In 1226 received town status as a free keiserby in the German-Roman Empire. When the city was part of Germany called the city of Kolmar. It came into French hands in 1697, but became a German in 1871, and French since 1945. 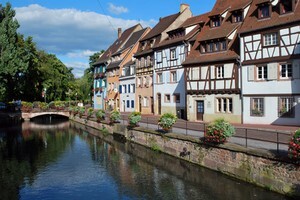 Colmar has many well preserved buildings from the Middle Ages and Renaissance. Here is the famous Isenheim altar from the 1500s by Matthias Grünewald, who is considered a masterpiece of sculpture genre. The city has several older buildings such as St. Martin’s Church from the 1200s and Dominicans Convent Unterlinden from the same period. Here is Unter Linden Museum today. The city also ethnographic, toy museum and the Bartholdi Museum, the designer of the Statue of Liberty in New York. There are also contemporary art museum Espace André Malraux. The nearest airport is Basel and Strasbourg, both approx. 57 kilometers from Colmar.